Tyler Hospital CEO Ann Marie Stevens (top, back, center) gathers the leadership Wyoming group in the lobby to begin their tour of the facility in Tunkhannock Township on Feb. 20. Participants in Leadership Wyoming’s Health & Wellness Day included (above, front, from left) team members Kelly Langan, Bonnie Nemergut, Michael Gomez, (back) meditation instructor Berni Kozlowski, team members Brad Georgetti, Matt Swartwood, Justin Kostelansky, Phillip McKeon, Kimberly DeLeo, Rick Hiduk, Diana Petlock, and Stevens. 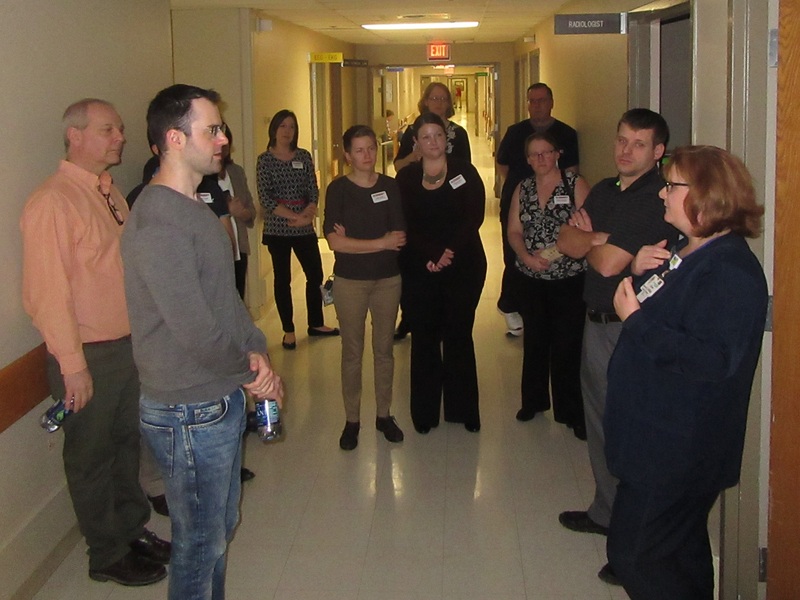 Leadership Wyoming (LW) team members took in quite a bit of information on Health & Wellness Day, Feb. 21. Presentations ran the gamut from holistic lifestyles and healing techniques to mainstream medical approaches and services and long-term care for elders. Objectives of the overview included developing a better concept of the variety of healthcare services available in Wyoming County and an awareness of national and regional healthcare concerns. 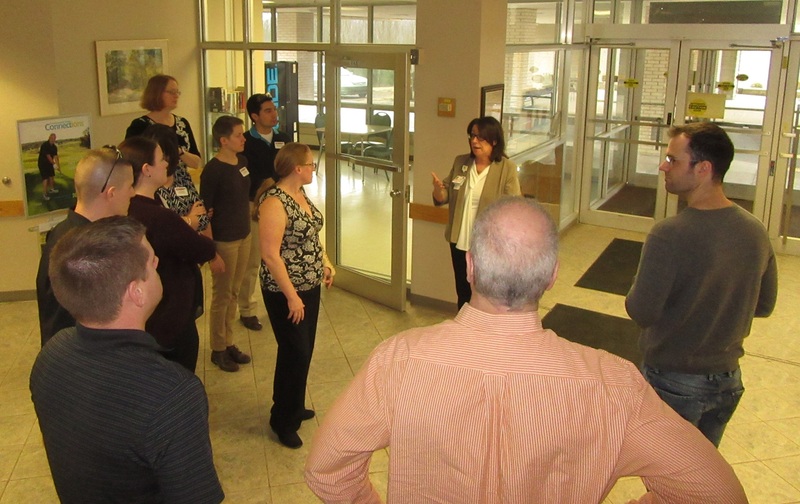 Morning activities conducted at the Wyoming County Chamber of Commerce offices covered nutrition, yoga, meditation and other approaches to natural health, followed by an introduction to Geisinger Health Systems. The team then went on to visit United Methodist Homes (UMH) and Tyler Hospital for tours and Q&A sessions at the facilities. “I loved taking the time in the morning to learn about and practice holistic wellness techniques before we dove into the heavier, yet incredibly interesting work that Tyler Memorial does,” said LW participant Kelly Langan of Camp Kelly, who cited Health & Wellness Day as her favorite monthly LW workshop to date. 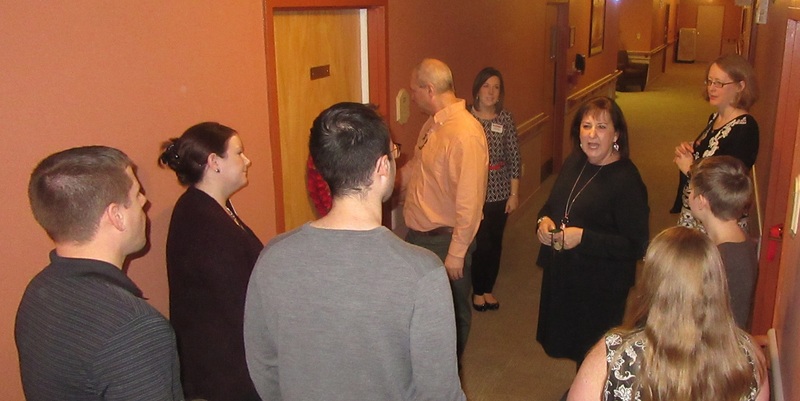 UMH administrator Annette Chickey (below) introduced the LW team to several staff members at the personal care facility in Tunkhannock and residents, who were happy to show their comfortable and well-adorned rooms to the tour-goers. The entire group also enjoyed lunch there in a private dining room. 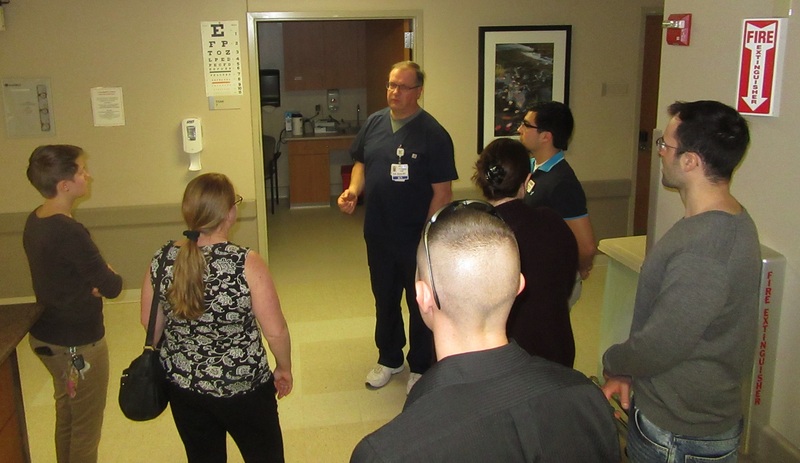 The tour of Tyler Hospital was more extensive, given the size of the facility, and included looks inside various labs and rooms where special services such as MRIs, blood draws, and mammograms are conducted. 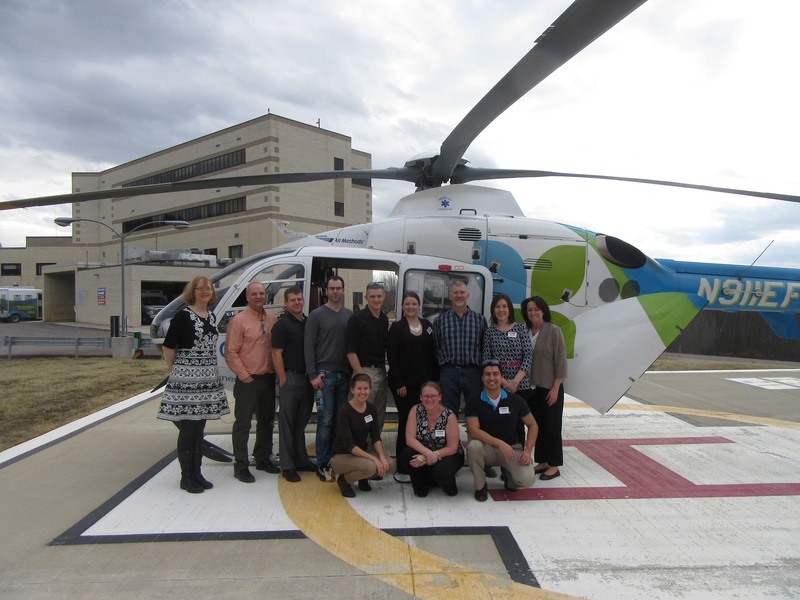 The group also got an up-close look at the Commonwealth Health life-flight helicopter and a glimpse at a state-of-the art ambulance before it was pressed into service. LW members were equally impressed by overviews of rural vs. urban healthcare, emergency preparedness at home, and the opioid crisis in Wyoming County as presented by emergency department director Ted Kross and Tyler chief executive officer Ann Marie Stevens. “What struck me most was the passion that Ann Marie and Ted had for providing a great quality of care to everyone who steps into the hospital,” Langan added. Additional presenters on Feb. 20 included registered dietitian Laura Maxson, registered yoga instructor Donna Fetzko, certified meditation coach Berni Kozlowski, and Geisinger community practice operations manager Dominique Del Prete. Leadership Wyoming is a nine-month program conducted and supported annually by the Wyoming County Chamber of Commerce. As the participants get to know the inner workings of a large variety of businesses and entities throughout the county by participating in day-long sessions, they are working to bridge the employment opportunities offered throughout the county with local students with a Career Fair planned at Tunkhannock Area High School on Wednesday, May 30. Managers of businesses interested in participating in the career fair may contact Langan at klangan@uncnepa.org. Tyler Emergency Department director Ted Kross (back, center) fields questions from Leadership Wyoming team members in the hospital’s ER as part of Health & Wellness Day. 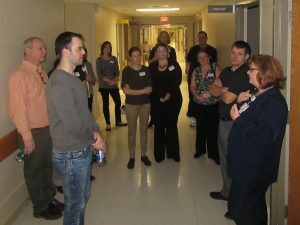 Leadership Wyoming team members got a look at Xray, MRI, CT scan, mammogram and other labs at Tyler Hospital with director of imaging Karen Phillips (right).